The Cooks Standard 9-Piece Classic Stainless Steel Cookware Set includes: 1.5 and 3 quart sauce pans with lids, 6 quart stockpot with lid, universal steamer insert with lid, and a 10 inch saute fry pan. 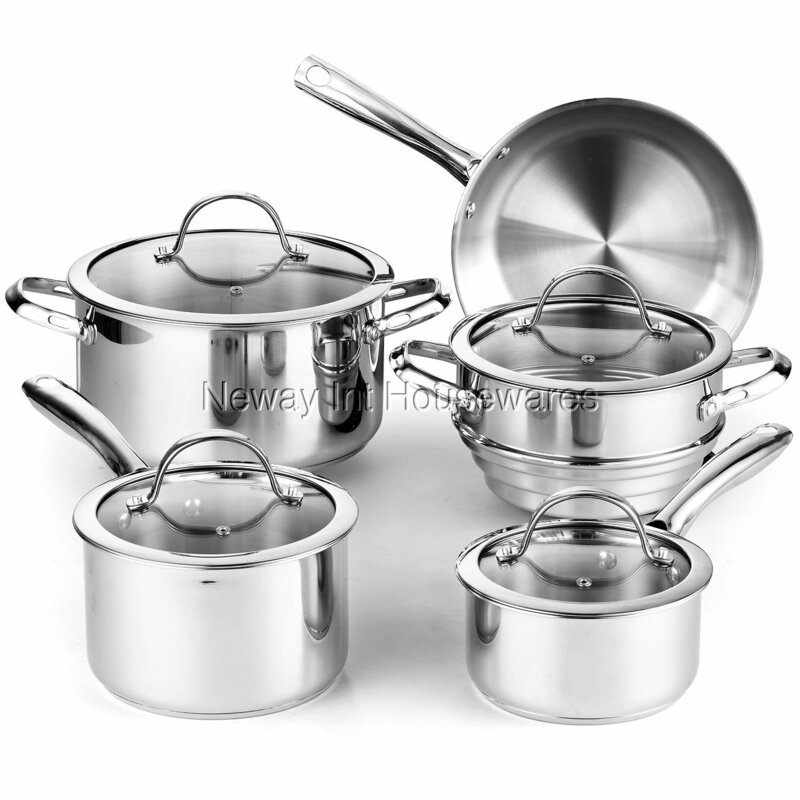 Cookware is made of 18-10 stainless steel with an aluminum disc layer in the bottom. The aluminum disc provides even heat distribution and prevents hot spots. Tempered glass lids have a steam hole vent and a stainless steel rim. Handles stay cool and are riveted for durability. Induction compatible. Works on gas, electric, glass, ceramic, etc. Oven safe to 500F, glass lids to 350F. Dishwasher safe. 9-piece set includes: 1.5-Quart covered saucepan; 3-Quart covered saucepan; 10-inch open skillet; 6-Quart covered stockpot; universal steamer insert with lid. 1.5 Quart covered saucepan measures 14 by 7 by 4 Inch. 3-Quart covered saucepan measures 14.5 by 8 by 5 Inch. 10-inch open skillet measures 18 by 11 by 2.5 Inch. 6-Quart covered stockpot measures 14.5 by 10 by 5.5 Inch. Universal steamer insert measures 12.5 by 8.5 by 6 Inch, fits both 1.5QT and 3QT saucepans.